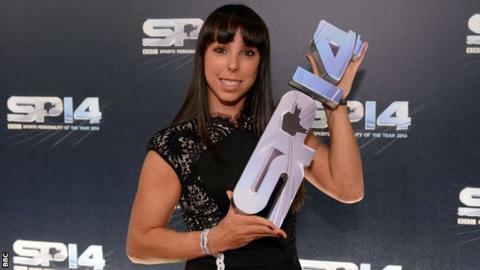 Olympic bronze medallist Beth Tweddle has had surgery on her neck after a fall during Channel 4's The Jump, prompting a review into safety procedures on the reality TV show. The retired gymnast, 30, had fractured vertebrae fused together after she was injured while training for programme. The Briton has quit the show and described the last 48 hours as "scary". A Channel 4 statement said it had asked the show's producers to re-assess every event and training plan. Olympic swimming champion Rebecca Adlington, 26, and actress Tina Hobley, 44, have already withdrawn because of injury. "All winter sports carry some element of risk but, in light of the number of injuries this year, Channel 4 has asked the producers to review safety procedures again," read a statement. Channel 4 added that events were "no more difficult" than in previous series and all competitors had "undertaken a rigorous training programme to prepare them for the show". Eddie 'The Eagle' Edwards, the first British Olympic ski jumper and an occasional guest on the show, said ski-jumping can be "a bit too dangerous" to newcomers unless they have spent a month skiing "all day, every day". He also said the show was prone to treating all the celebrities the same way irrespective of skiing experience. He told the Mirror: "They have got to look at ways to make it safer for the celebrities or someone is going to pull the plug on the show. "They won't be able to afford the insurance cover on these guys." However, Channel 4 insisted that all competitors "are assessed and receive bespoke training according to their ability", adding: "No competitor is cleared to jump unless experts deem them proficient." Tweddle's operation was described as a "success" by her parents, who added: "The early medical indications were positive as Beth was able to move her hands and feet, despite being in a lot of discomfort." Tweddle, who is in hospital in Austria, added: "The last 48 hours have been very scary but all the messages have really helped to keep me positive. I will keep you updated on my progress." Tweddle was third on the uneven bars at the 2012 Olympics and won six European titles and Commonwealth Games gold before retiring in 2013. Adlington, who won two swimming gold medals for Britain at the 2008 Olympics, suffered a shoulder injury, while Holby City actress Hobley dislocated her elbow and suffered two fractures to an arm.